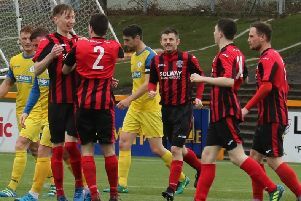 Dalbeattie Star’s losing run came to an end when few fans would have expected it, as they got the better of high flying Kelty Hearts in an engrossing 90 minutes at Islecroft. Kelty started the game brightly, controlled the early part of the encounter and opened the scoring after 16 minutes. The visitors made a quick break down the left flank and worked the ball well across the 18-yard line to new signing Sean McKirdy, who made it a dream debut as his shot from the edge of the box flew high past Parker with the aid of a deflection. Within seconds it was almost a whole lot worse for struggling Star but Parker produced a terrific save from Errol Douglas and thankfully for Star the rebound was headed wide. Star’s first real effort on goal came in the 26th minute when Ben Irving fired over from 25 yards but just after the half hour Douglas had a great chance but his close range header was straight at Parker. Despite being a goal down at the break the home support must have been optimistic for the second period after their first half showing and, within seconds of the re-start, they were back on level terms with a goal of real quality. Lewis Sloan played in Lewis Todd whose cross was left by Milligan in the centre, which set up Irving who gleefully drilled the ball low past Christie around 10 yards. Neither side was settling for a draw and what would be the winning goal duly arrived in the 79th minute. Sloan took the ball for a run down the right wing before skipping inside Douglas, he whipped in a brilliant cross that picked out Todd’s superbly timed run and his glancing header left Christie absolutely helpless. The celebrations both on and off the park showed just how important this goal was to the club as a whole. Part two in Star’s four home games in a row sequence, is on Saturday against University of Stirling. The players must now show that this performance is the benchmark for all future games and not just a one off.